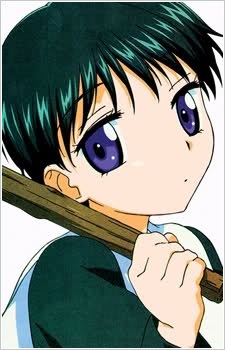 Gender: Female Date of birth: October 25 Age: 10 Horoscope: Scorpio Height: 139cm Weight: 30kg Alice: Invention Alice Stone Color: Purple Hotaru is an extremely intelligent and rational girl. She is considered to be a geek and more than a little strange because of her aloofness. Like Natsume, she is usually poker-faced, but possesses some humor in her. She may treat Mikan unkindly most of the time, but it is apparent that she deeply cares for her. Somehow, she likes to bully people she likes. Hotaru is Mikan's best friend and the main reason why Mikan came to the academy. She and Mikan have what may seem to be a doubtful and strange relationship. Hotaru comes off as cold, quiet, geeky, and bad-mouthed but calm. Her "stupid" points are her tendency of being a "pig" when it comes to food and her greedy side, this happens in a comical manner. Her Alice is Invention, which allows her to create unique and strange inventions. She belongs to the Technical Class. She is currently a Triple Star. Her name "蛍 - Hotaru" means "Firefly". After Mikan wasn't able to save collapsed Natsume with her fading alice, Hotaru joined her brother and Nodacchi on their mission to find a way to save Natsume. Before departing she promises Mikan that she will be able to see her 'most important person' again. Then they travel back in time to the moment right after Natsume has lost consciousness. Despite Nodacchi's earlier warnings not to disrupt spacetime even further, which can cause unexpected events, Hotaru tries to save Natsume, but her brother stops her and heals him with his alice. Knowing the risk of changing the past they have no choice but to wait for their 'punishment'. Still Hotaru pleads to Noda to let her say farewell to Mikan before she leaves Academy and has her memories erased. After their meeting Hotaru returns to spacetime without explaining Mikan anything and beggingher in thoughts not to completely forget her if possible. As Noda and Natsume are about to go back to the present, Hotaru and Subaru are pulled deep into spacetime and disappear. Currently it is unknown if Imai siblings still remain trapped in spacetime and (in worst case scenario) everyone else forgot about them.